But only every other hour or so. Probably. Good point, not a main drummer but even coupled with a Volca Beats or 606 could fill the beat out nicely. I buckled and pre-ordered both the new Volcas, it’s a sickness I tell you. Apparently mid March for Drum, mid Feb for modular. This video makes me think of Edward Norton in Fight Club! Jealous! Can’t wait to hear your take on them. My husband is now spoiled for choices on what to get me for my birthday…in June. Waaaaah! This is extremely cool. I wonder if it’ll respond to program changes? The MIDI implementation chart can be downloaded from the Korg website. Well, it’s not available yet but I look forward to studying it as soon as Korg shares it. Same here, but I have a box of these kind of table beasts, as I find that they can be fun to whip out for a sampling session or just mucking around, and I think they fit that usage style well, none of my Volcas or Pocket Operators are ever permanently set up, and even some of my larger gear has to be stowed away if it isn’t core to my setup. I do believe i’m more interested in this one than the volca modular. hopefully the midi implementation is better than the other volcas. Great inspiration for getting a track started, and ultimately using the sound it produces more in the background, along with more hi-fi sounds up front. Layers, layers, layers. Starting tunes from the “back of the room” yields unique results. Especially for electro. I’ve had that happen with grabbing the Volca Beats and the PO-24 Office one day when needing some drums fast for something I was doing on Monomachine. I didn’t have room nor time to set up a full kit on Machinedrum. I thought those drums would be temporary but the combo of the Volca Beats and Pocket Operator made for surprisingly good percussion. When I made the song part of my live set, I basically tried to model the Volca with Machinedrum using the TR-* machines to preserve the flavor of the original. That made me really impressed with these two series of low-cost instruments. I’m curious how the Volca Drum will be. I love the depth of Machinedrum, but sometimes the act of building up a new kit is enough overhead to make me reach for something simpler. Volca Drum feels like it could be similarly complex - but that’s why I have so many damn little drum machines now (and I love 'em). I’ve got this pre-ordered. I had been looking at some wave-guide based Eurorack modules and other physical modeling modules, but just never wanted to commit to buying into that world any further. These new Volcas have me very happy. 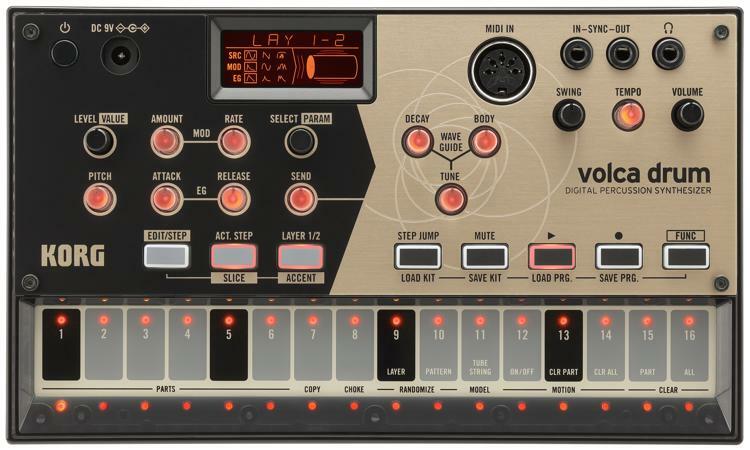 Compared to LXR the volca drum has an physically modelled resonator, which hasn’t been seen on drum machines or music instruments that much before. It’s quite exciting (haha) for drums. Mutable Instruments Rings eg. is a resonator. Watched some demos now, I guess this will be my first Volca. Love digital drums. This is a neat package. Totally agree and it’s funny you mention that because it’s how I’ve been using my OP-Z. This thing sounds interesting, and looks great for the price($149?). I wish Korg would have redesigned the box/interface a bit for these though. I get price point, but slightly bigger knobs and moving the MIDI and power jack to the back would have been welcome. intellijel plonk, MI elements, Ableton’s AAS plugins, etc… great stuff. Sorry if someone already brought it up, but each of the 6 parts has its own sequencer? Wow! Yea, pretty rad. First Volca with polyrhythms!